Two decades on from the start of the ‘Singing Revolution’, and five years on from the Baltic States’ entry to the European Union, the time is ripe to take stock of Estonia’s remarkable transition from Soviet Republic to EU member state and address the challenges - some new, some ongoing - and uncertainties that have arisen following the country’s entry to the EU. This book locates the post-accession period within the broader sweep of post-communist transition and diagnoses the problems facing Estonia as the global economic downturn takes hold and a new mood of pessimism reigns in Central and Eastern Europe. Until recently, Estonia enjoyed an international reputation as an emerging high-growth ‘tiger economy’ and reform pioneer, not least in the sphere of IT. This economic success story, however, masked the continued problematic political and social legacies of the Soviet period, including the issue of ethnic integration, which again hit the headlines following riots in Tallinn in April 2007. 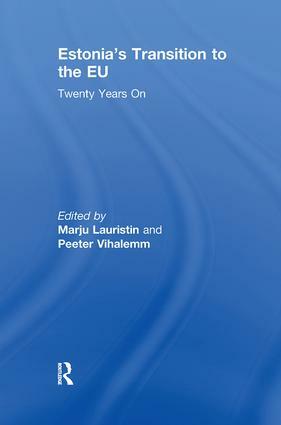 This fully up-to-date appraisal - the first in English - covers all of the key issues, and will appeal to specialists in Baltic and Central and Eastern European politics and society, as well as to anyone with an interest in European integration more generally. This book was published as a special issue of the Journal of Baltic Studies. Marju Lauristin is Professor Emeritus at the University of Tartu and works as Professor of Social Communication in the Institute of Journalism and Communication. Her research interests are related to the social, cultural and political conditions and implications of the Estonian post-communist transition. Peeter Vihalemm is Professor of Media Studies at the Institute of Journalism and Communication, University of Tartu, Estonia. His work has been focused on political and cultural aspects of postcommunist transformation, especially on development of media system and media use, and changing spatial relations in the Baltic Sea region.